Helston Farmers’ Market are holding two markets this month, one on Saturday 7th December and a Christmas Food Market on Saturday 21st. With a wonderful selection of fresh, local produce from over 35 producers, the market also provides the opportunity to order ahead on the 7th December and pick up just before Christmas on the 21st. For Christmas shoppers, there will be freshly cut, local trees affordably priced that will last for weeks along with handmade wreaths and decorations. Making their appearance for the first time at the market is Tregullas Farm from the Lizard selling goat salami and duck eggs, something you won’t find in the supermarket! 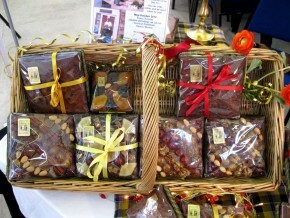 For a full list of producers, visit our facebook page www.facebook.com/HelstonFarmersMarket. The market is organised by South Kerrier Alliance CIC and trades from 9.30am to 1.30pm. Located indoors in the Old Cattle Market building at the Boating Lake in Helston and next to Lidl’s, there is good disabled access and facilities. For more information, please contact Joanne Schofield on 01326 231146.